1-Day Acuvue Moist contact lenses are not the newest of the daily disposable contact lenses available, but they have been a good solution for many patients for many years. If fit correctly so the lens curvature is a good match with the curvature of your cornea, these can be quite comfortable. 1-Day Acuvue Moist contact lenses are not as oxygen permeable as some of the newer materials (such as 1-Day Acuvue TruEye), but they do have a number of features that allow them to provide good vision and comfort. These include ultraviolet light protection as well as Acuvue Lacreon technology that helps with lens wettability. Wettability is the word used by eye care providers and contact lens manufacturers to refer to the ability of the surface of the contact lens to hold water and provide a “cushion” of lubrication between the corneal surface and the lens itself. As with all daily disposable contact lenses, 1-Day Acuvue Moist contact lenses are a great choice for allergy sufferers or patients that tend to accumulate deposits on their lenses over a two-week or monthly wear cycle. 1-Day Acuvue Moist contacts are also great for patients who are sensitive to the chemicals in contact lens cleaning and storage solutions. Since these lenses are disposed of at the end of the day, and not stored in solution, there is no chance of solution sensitivity developing. There is also a decreased chance of infection, as many ocular infections can be traced back to contamination of the lens during storage (which by the way, is why we generally recommend daily disposable contacts for young wearers). In general, daily disposable lenses cost a little to a significant amount more than lenses that must be stored in solution. However, for someone who only wears there contacts 2-3 days a week or less, daily disposable lenses can actually be a cheaper option. 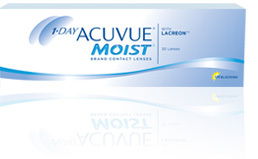 You can purchase 1-Day Acuvue Moist contact lenses from our office with just a phone call. If your last contact lens exam was with us, we’ll have your prescription on file for you, so there’ll be nothing you have to do other than give us a call and let us know how many boxes you’d like. If you pick your lenses up at our office then there’s no shipping charge, and it only takes a day, or sometimes two, for your lenses to arrive at our office. We can also ship your 1-Day Acuvue Moist contact lenses directly to your home. Shipping is free on annual supplies shipped to your home. If it has been more than a year since your last contact lens exam, you will need a new eye exam and CL fitting or evaluation to ensure that 1-Day Acuvue Moist contact lenses are still the best choice for your ocular health and vision. You can schedule your contact lens exam online or call our office at (503) 444-7639 with any questions.